Pictured above: Mary Zhuga (RN), Sarah Madega (AIN), Cleo Zimunya (AIN), Richard Holloway (CN), Melisa McKay (AIN), Latha Kamalakaran (AIN), Bidhya Shrestha (AIN), Naryan Kc (AIN). Our night shift team are truly one of a kind. SwanCare has nearly 40 employees that regularly work night shifts over our three care facilities and combined, they’ve served for over 370 years at SwanCare - which speaks volumes about their connection to the organisation, to each other, and importantly, to their residents. 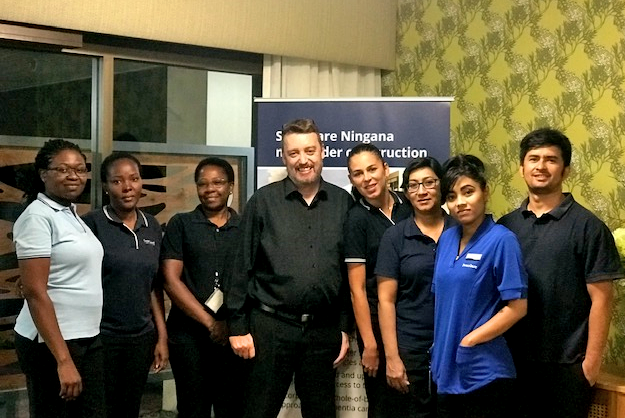 To understand what it means to work nights at SwanCare, we spoke to Richard Holloway, Night Shift Coordinator for Tandara and Kingia (pictured centre) and Bidhya Shrestha, Assistant in Nursing (AIN) (second from the right). After working in emergency wards and aged care facilities in the UK, Richard moved to Perth in 2003 and joined SwanCare as a registered nurse. After a few weeks, he took the opportunity to become the night shift coordinator for the adjoining SwanCare Tandara and SwanCare Kingia care facilities - a role he has been doing ever since. Richard coordinates the night roster and clinical care plans, manages calls to nurses, and oversees the night team and the residents in their care. Bidhya moved to WA from Nepal with her husband and brother, and began studying nursing. In 2016, she was offered a role as an AIN on the night shift at SwanCare. Bidhya provides holistic care to residents to ensure they can be as happy and comfortable as possible. Forget 9 to 5. Welcome to 9pm to 7am. What does it mean to work the night shift? Contrary to popular belief, the night shift is not simply a “quieter version” of the day. While there might be less going on ‘visibly’, and the environment can be more relaxed, the night shift team plays a vital role in delivering consistent care and support to their residents. When asked how she feels, Bidhya pauses. “This is a significant question. Sometimes, some residents can be aggressive and we must call a supervisor. This can be confronting but it’s an important part of our role. And usually, I feel peaceful and proud of our team because we have done our best work for the residents. The residents thank me and say, “You cared for me like my own daughter”. This is unforgettable,” she says. It isn’t well known that during the night, staff often have the opportunity to spend more quality time with residents who may find it harder to settle, or who simply enjoy a midnight cuppa. For Richard and Bidhya, it’s the best part of the night shift. “Some residents can find it hard to wind down. Sometimes I hear a staff member laughing with a resident at 3am, sipping a cup of tea. I love that. In those moments, we get to spend fantastic quality time with residents,” says Richard. It’s clear Richard and Bidhya have a deep and genuine care for their residents that extends beyond their formal duties. “The great majority of residents are so kind. I feel emotional about them because I never met my own grandparents. For me, they are my grandparents, so at SwanCare, I never feel like I’m actually going to work,” Bidhya shares. Advice for people starting night shifts? Richard and Bidhya advise anyone considering the night shift to remove any preconceived ideas that it’s easy. “It’s quieter, but it is hard. If you do night after night, it can impact you, and you need to adjust and rest. I come home and sleep four to five hours. You’ve got to find a routine that works for you,” Richard says. Bidhya shares that view, and goes further: “Some people think you will become isolated, suffer health problems or have less quality time with your family. But this is not really the case. I don’t have a huge amount of time with my family, but I have 2 to 3 hours of quality time every day - and that’s what matters to me. If you manage your routine, it will work for you”. And finally - why SwanCare? Richard also loves working at SwanCare, and reflects on how his employer has been instrumental in helping his family through an incredibly difficult time. “At a personal level, 18 months ago, my wife was diagnosed with cancer. It changed my life dramatically. I sometimes need to drive my wife to appointments, start and leave work earlier or need to cancel a shift at last minute - and SwanCare has been really accommodating. There are companies that would just say ‘no’. SwanCare not only supports its residents, but has supported my life,” says Richard. We are so grateful to have you, Richard, Bidhya and the entire night shift team. We rely upon you and could not be prouder of all that you bring. Thank you all.